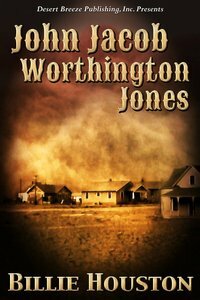 In 1935 John Jones is an unrepentant hobo and con-man whose past has caught up with him. He is being carted off to jail, when a strange young woman with a two-year-old child on her hip, stops the police chief, insisting, there has been a mistake. The man he has in tow is her husband, Reverend John Jacob Worthington Jones. Ruth Harvey needs a man with nothing to lose. Who better than someone at odds with the law? She says a short prayer, and tells a little lie. The domino effect of her hasty falsehood, sets in motion a chain of unexpected events that will change her life forever. About "John Jacob Worthington Jones"